Various manufacturers of disaster shelters—including Hardened Structures in Virginia Beach, Virginia, and Radius Engineering in Terrell, Texas—offer bunkers designed to withstand a spectrum of potential catastrophes: comet strike, supervolcano, swine flu, solar flare, cyberterrorism, freak storm featuring 100-pound hailstones, brown dwarf star intrusion or global economic collapse. One may choose from specialized tsunami pods, tornado-proof mini-pyramids or more all-purpose luxury condos (complete with stainless steel appliances) nestled in former missile silos. 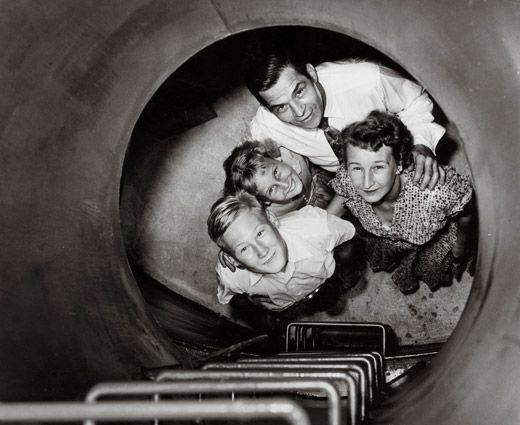 Speaking of those silos, the cold war-era suburban fallout shelter craze was equally surreal, says Susan Roy, author of Bomboozled: How the U.S. Government Misled Itself and Its People Into Believing They Could Survive a Nuclear Attack. Housewives planning to hunker down in backyard bunkers were advised to repurpose their ironing boards as stretchers and to plot post-Armageddon menus involving Bing cherries and creamed chipped beef.